There have been some exciting landmarks in space exploration in the past year or so. Private corporations like SpaceX have proven that they’re dead serious about their commitment to pushing space exploration forward in a way many of the major governments haven’t tried in a long time. We’ve had headlines that a few years ago would have read like outright science fiction, from a reality show that wants to give people a one-way trip to Mars, to a plan to mine freakin’ asteroids that includes James Cameron among its supporters. That latter jaw-dropper is under the auspices of the company Planetary Resources, and The Atlantic interviewed PR co-founder Eric Anderson a while back about the coming age of space exploration, expansion, and even colonization. For most of my life, space exploration has seemed like a rapidly dwindling dream that made me sad I was born too late to see the space race of the ‘60s and ‘70s. With the collapse of the Cold War, one of the primary motivating factors to keep pushing onward and upwards vanished as well, and economic problems across the board have kept governments for throwing the cash at space exploration that they once did. Now private companies are stepping forward, and not in a small way. Companies like SpaceX and Planetary Resources are daring to dream big, and I’m keeping my fingers crossed that I’ll live long enough to see some of the sci-fi wonders I grew up reading about. Anderson thinks that is entirely possible, with a permanent colony on Mars likely happening sometime between 30 and 60 years from now. This Mars colony will start off with a few thousand people, and then it may grow over 100 years to a few million people, but it will be there permanently … My colleague Elon Musk is aiming to get the cost of a flight to Mars down to half a million dollars a person. I think that even if it costs maybe a few million dollars a person to launch to Mars, a colony could be feasible. To me the question is, does it happen in the next 30 years, or does it happen in the next 60 to 70 years? There’s no question it’s going to happen in this century, and that’s a pretty exciting thing. Anderson sees the key to this approach in the asteroids, especially of the near-Earth variety. That’s why Planetary Resources exists. The near-Earth asteroids, which are very, very close to the Earth, are filled with resources that would be useful for people wanting to go to Mars, or anywhere else in the solar system. They contain precious resources like water, rocket fuel, strategic metals. 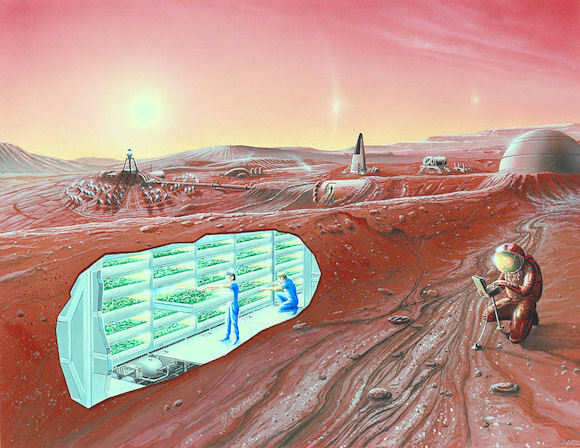 So first there needs to be a reduction in the cost of getting off the Earth’s surface, and then there needs to be the ability to ‘live off the land’ by using the resources in space. …our prospecting mission to a set of targeted asteroids will use the Arkyd line of spacecraft. The first of that series, the Arkyd-100, would have cost $100 million, minimum, in the traditional aerospace way of business and operation. But with the engineering talent we have, and by using commercially available parts and allowing ourselves to take appropriate risks, we’ve been able to bring that cost down to $4 or $5 million dollars. Our first missions, for asteroid reconnaissance, will be launching in the next two to three years. For these missions, we’re going to launch small swarms of spacecraft. When I say small, I mean we’ll send three or four spacecraft, and each one of those spacecraft may weigh only 30 pounds. But they will have optical sensors that are better than any camera available today. They will send back imagery, they’ll map the gravity field, they’ll use telescopic remote sensing and spectroscopy to tell us exactly what materials are in the asteroid. It will be possible to know more about an ore body that’s 10 million miles away from us in space than it would be to know about an ore body 10 miles below the Earth’s surface. We’re really not talking about if; we’re talking about when. I have no doubt that the challenges of getting back to the Moon, to Mars, and beyond will be challenging and sometimes frustrating, but they are absolutely goals worth pursuing if our species is ever to step beyond the cradle (and, by extension, lessen the chance of us wiping ourselves out entirely while stranded on one planet). Meeting these challenges will require skill, determination, cash, and more than a little chutzpah. But who the hell ever said it paid to dream small? Even if nobody cares about the moon, I still think it’s worth doing a test colony there first. They would learn a lot about putting humans on another planet. And if something really unanticipated occurs, they are a few days away instead of years. Great article. I like the idea of being apart of an initial colony on Mars. But I LOVE the idea of blasting off into space SGU style and exploring the galaxy. How long before that’s possible?! That could happen sooner than we think.Recent experiments have shown a space drive using a wrapping of space around a vehicle could exceed the speed of light without violating the laws of physics.There are several people working on making it a reality right now.I only hope I live long enough to see it happen.